Isaac Lowe leads out the teams ahead of Morecambe's game against Northampton. Isaac Lowe is calling on the Lancaster and Morecambe district to get behind its rising sporting stars. The Morecambe FC fan, who defends his English featherweight title against Ryan Doyle at the Manchester Arena on November 21, believes local support can take him and The Shrimps to the next level. 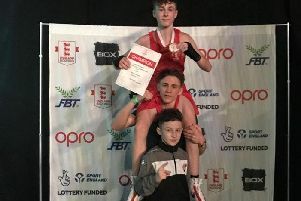 Lowe isn’t the only boxing star on the rise in the area with his young cousin William Birchall, just 14, starring for England at the recent European Championships in Russia, and Bentham light heavyweight Tomi Tatham improving with every fight. The Shrimps have been one of the most entertaining sides in the Football League this season but are still struggling to attract bigger crowds that could help take them to the next level. Echoing comments of Globe Arena boss Jim Bentley, Lowe said: “I think the people of Lancaster and Morecambe need to get behind their footballers and their boxers, all the sportsmen really. “Morecambe FC deserve bigger crowds and there’s a few good boxing kids coming through. “There’s me, Tomi Tatham and I’ve got to mention my cousin William Birchall who did brilliantly for England out in Russia. “We aren’t just doing this for ourselves, we’re doing it for the community and to bring big sporting occasions to Lancaster and Morecambe. “We can only do so much with the heart and effort we put in. In the past Lowe, who regularly attends games, has spoken of his desire to bring a big fight night to the Globe Arena.